Want Happy Clients? Communication is Key. > Want Happy Clients? Communication is Key. My wife, Alexis, rarely asks me to take a photo for her. She is generally satisfied with documenting everyday life with her smartphone, so when she asks me to photograph a particular subject, I usually take notice and fulfill the request as soon as possible. But I admit to dragging my feet a bit when my wife noticed one of her aloe plants blooming and said, "You should take a picture of that." 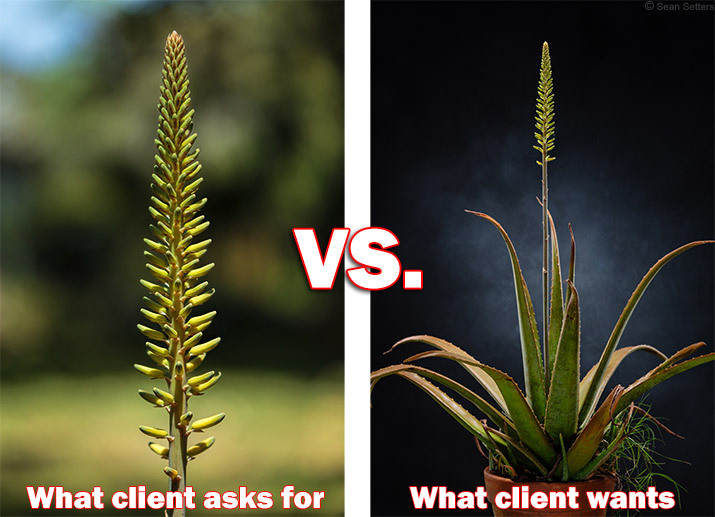 Personally speaking, I didn't find the aloe plant's bloom to be very intriguing, which is probably why I didn't immediately rush to photograph it. It doesn't feature colorful petals or otherwise interesting elements that typically make blooms ideal photographic subjects. 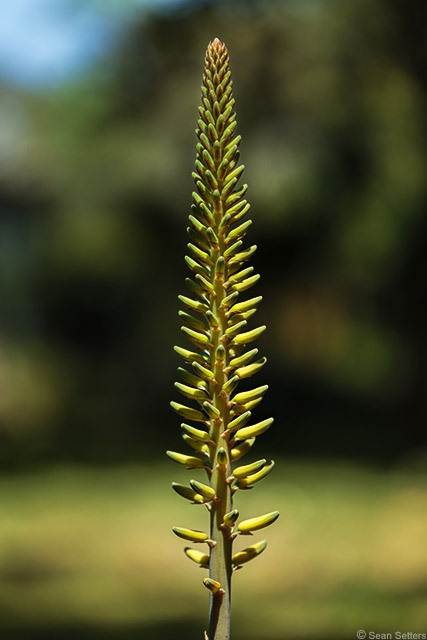 To my eye, the aloe bloom's shape reminds me of a tall, thin pine tree, a not-very-compelling subject, especially considering the background context provided by my back yard (again, not very photogenic). However, when my wife sent me a reminder the following morning, "You should take a pic of that aloe bloom!," her use of an exclamation point was a clear sign that she was very serious about the suggestion. So, I dropped what I was doing to satisfy her request. 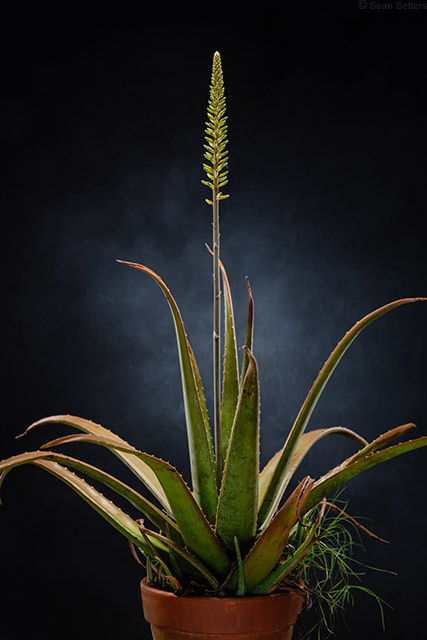 To photograph the bloom, I moved the aloe plant's pot from the back porch to a spot in the yard where sunlight would be hitting the bloom but not the background, allowing me to use the difference in luminosity to make the subject stand out. With the Canon EF 100mm f/2.8 USM Macro mounted to my Canon EOS 5D Mark III, I also used a wide f/2.8 aperture and a distant background to further accentuate the subject/background separation. Other than moving the plant (which was actually quite cumbersome and somewhat heavy), the image was relatively simple to capture. I proudly sent her the result of my efforts, having precisely fulfilled her request. Her reaction, "Where's the rest of the plant?," left me a bit perplexed. First, she hadn't asked for a photo of the plant with the bloom. She had twice asked for a picture of the bloom. Plus, from my perspective, the plant doesn't change very much day-to-day. If she wants to see the plant, she can just open back door and walk the 10 paces to its home on the porch. The bloom was what made the plant different from its typical appearance, that is what she asked me to photograph and that is indeed what I documented. But that's not what she – in this case, the client – wanted. And if I had been more inquisitive from the get-go, I would have had more context and could have discerned exactly what she desired in the image. As it turns out, this particular aloe plant used to be her grandmother's who passed away a couple of years ago. And in all the years her grandmother owned the plant, the family had never known it to bloom. So while the bloom was indeed special, the plant itself garnered feelings of great sentiment, giving the bloom much more important context. After realizing exactly what my wife wanted, I dragged the plant into my studio for a formal portrait session involving three studio lights, two shoe-mount flashes and my favorite mottled gray collapsible background. So why not photograph the plant outside? Because the increased camera-to-subject distance would require an increased subject-to-background distance to achieve a similar background blur, and the background distance, in this case, wasn't variable. I was already using nearly the full width of my backyard when I photographed the isolated bloom; photographing the whole plant would have left the backyard – including my neighbor's house and fence – too recognizable. The resulting studio image can be seen below. She was much happier with my second attempt at capturing "the bloom." Of course, the initial failure to capture what my wife really wanted did not have devastating consequences as I was able to rectify the situation with another (more complex) photo shoot the following day. However, the lesson learned from this ordeal is quite clear, and it will surely pay more tangible dividends down the line. Don't take seemingly simple requests at face value; always dig deeper to ascertain the precise needs of your client, potentially avoiding the wasted time, effort, frustration – and dissatisfaction – resulting from not fulfilling those needs the first time around.